In this month’s Spotlight on Social Enterprise, Maggie McGowan talks to Pro Bono News about Magpie Goose, a loud, funky fashion brand she co-founded hoping to share Aboriginal stories and empower remote communities. Founders of Magpie Goose, (L-R) Laura Egan and Maggie McGowan. Photo by Sarah Mackie. In this month’s Spotlight on Social Enterprise, Maggie McGowan talks to Pro Bono News about Magpie Goose, a loud, funky fashion brand she co-founded hoping to share Aboriginal stories and empower remote communities through employment opportunities. 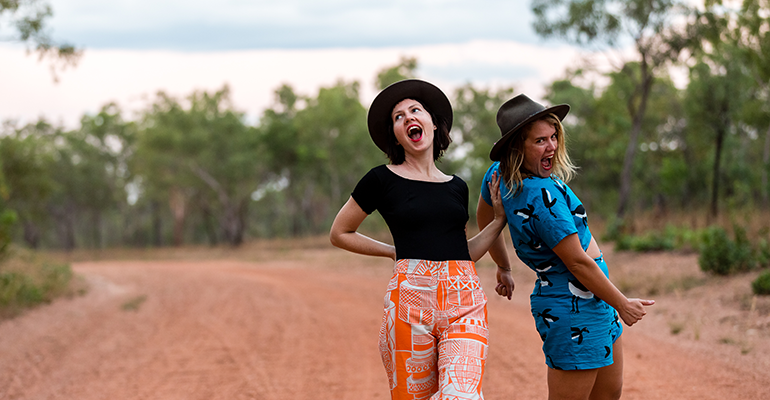 When McGowan graduated from an arts-law degree in Melbourne, she didn’t think she’d own a fashion brand running out of a rural part of the Northern Territory. “I moved to Darwin after graduating uni to work as lawyer for the North Australian Aboriginal Justice Agency, and we were going out to remote communities a lot,” McGowan tells Pro Bono News. Feeling disappointed with the conditions she saw in the communities, and her role in it as a lawyer she started looking into other ways she could tackle the issue. It was when the now co-founder of Magpie Goose Laura Egan asked her what she would be doing if she wasn’t a lawyer, that the idea started to gain traction. “I told Laura that it would definitely be something to do with all the incredible textiles, because they had so much potential to help people connect with Aboriginal culture, and also to help generate employment in communities,” McGowan explains. With over 10 years experience working and fostering grassroots projects in remote communities, Egan had the expertise needed to oversee the financial and strategic side of the the business. Their impact is, as McGowan describes, “a two pronged approach”. 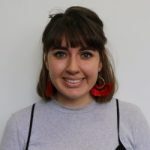 She says it wasn’t until her and Egan moved to the NT as adults and were fully immersed the different cultures that they realised they hadn’t really been given the chance to learn about the Aboriginal history or culture. “I think we felt ripped off,” she says. Magpie Goose began as a Kickstarter project, and is now being incubated by Enterprise Learning Projects, a company that Egan founded and runs, which works to address the economic exclusion of Aboriginal people. The pair are based in Katherine, and have business relationships with art centres, individual artists, textile designers, screen printers, graphic designers and photographers across urban and remote Australia. They started off working with four art centres that already had a big catalogue of designs ready to go, but were now working with artists and communities that don’t have art centres to extend their impact. “We’ve been going out to places around Australia and running textile design workshops, where we show them past Magpie Goose designs,” said McGowan. “We’ll then talk to people about the stories that come from their communities, and what they’d like to share through textile design,” she says. McGowan says one of the biggest highlights of running a business like Magpie Goose was seeing the pride of the artists when they were able to tell their story through art, especially when it was first time artists. 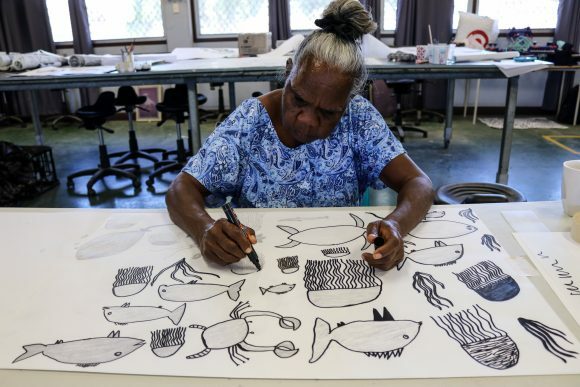 “We were just up at a women’s centre in Kalumbaru, in the far-north of the Kimberley region, and the people we were working hadn’t done a lot of art, had never done textiles, or screen printing, and they were so proud to see the finished design,” she says. She also says textiles were a very accessible way to connect with their stories and culture. “People can buy a top and then you’ve got a connection with the artist and the community and and that can start the conversation,” she says. McGowan says showing people positive stories in remote communities was very important to frame policy and the national conversation around Indigenous affairs. “You can’t really have change unless people living remotely have an access point to improve their lives, or feel more confident,” she says. As the business grows, Magpie Goose have provided a bigger range of employment opportunities, such as working with a photography collective in the Kimberly, and modelling the clothes. They also have plans to create clothing collections in partnership with communities, not only to give them insight into the fashion industry, but to give them a sense of ownership. 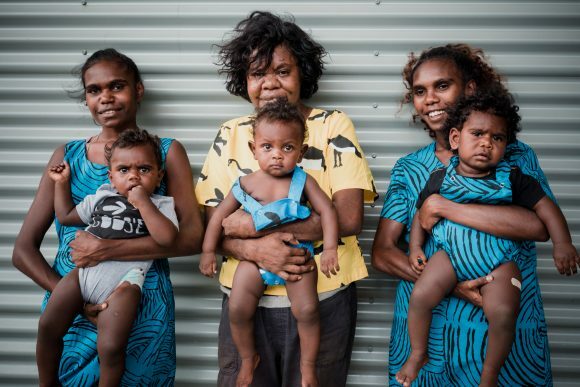 “We’ve got a collection coming up in far north Queensland, where we will do a fashion show, and work with the young women to explore opportunities for them to be involved in the world of fashion,” she explains. Aboriginal textiles in Australia are fast gaining recognition and popularity, which McGowan says was bound to happen, the world just had to be ready for it. “The talent had always been there,” she says. “There’s a lot of people in the industry who for a long time have been fostering talent, and working with people from remote places. They were just waiting for people to be interested, and it’s reached a tipping point. What a great business and I’m sure those communities welcome the opportunities on offer.